Attention, Straw Hat Pirates! A stunning series of Figuarts ZERO One Piece characters are making their way to you based on the movie One Piece Film Gold. Everyone's favorite enigmatic hero Luffy appears in glossy black attire and goggles unique to the movie. 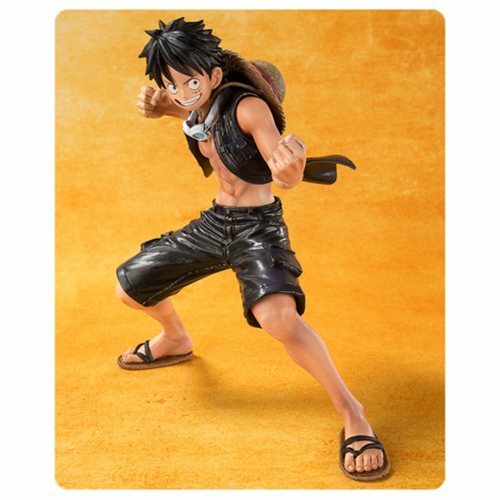 Not only is Luffy meticulously sculpted, but he also comes with interchangeable head pieces so he can be posed wearing the goggles as well! Set includes display base, and aforementioned interchangeable head piece. Measures approximately 5 3/4-inches tall. Ages 15 and up.